Coinciding with the opening of the 68th United Nations General Assembly, the governments of the Netherlands and Nigeria, in association with the Global Centre for the Responsibility to Protect, co-hosted the 6th annual Ministerial Meeting on the Responsibility to Protect (R2P). The meeting opened with statements from the two co-hosts: the Minister of Foreign Affairs of the Kingdom of the Netherlands, H.E. 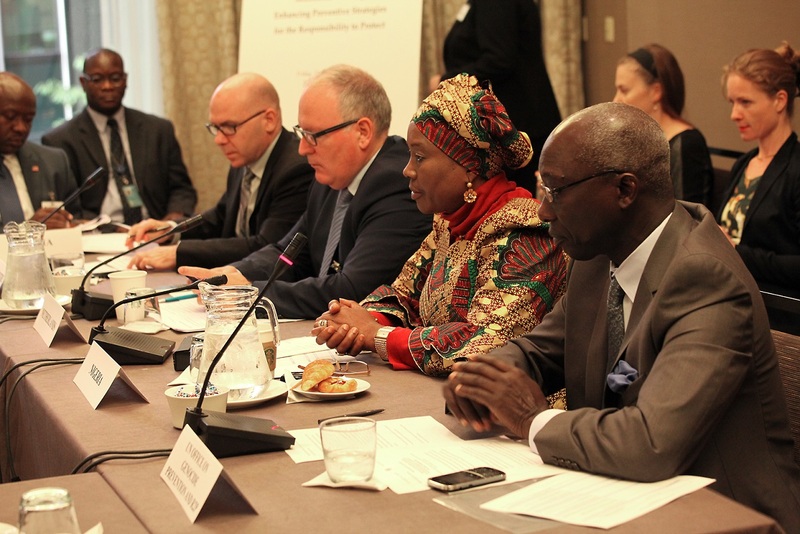 Mr. Frans Timmermans, and the Minister of Foreign Affairs of the Federal Republic of Nigeria, H.E. Professor Viola Onwuliri. Ministers representing eleven governments from across the globe participated in the meeting. The UN Secretary-General's Special Adviser on the Prevention of Genocide, Mr. Adama Dieng, also attended and delivered remarks on behalf of the Secretary-General. The 2013 meeting was also notable for the large number of countries attending as high-level observers, twenty states in total. This 2013 Ministerial Meeting sought to expand upon the discussion of national preventive measures discussed in the UN Secretary-General's 2013 report on R2P, State responsibility and prevention, and the subsequent UN General Assembly Interactive Dialogue on the report, held on 11 September.